Pant-style waders have become quite popular in recent years, and the reasons are obvious: they keep the torso from overheating, they are the most comfortable style to wear and walk in over the course of a day, and they don’t make you look like you’ve added 50 pounds to your waistline. But they come with one chief disadvantage: if you need to wade in water over about crotch level, you’re tempting fate. But at August’s ICAST/AFFTA show in Orlando, Chota Outdoor Gear‘s Frank Bryant pulled me aside and said, “Can I show you something?” I learned a long time ago that when Frank, who’s been designing outdoor gear since 1974, asks if he can show me something, I’d better pay attention. Frank reached for a pair of new waders and began to disassemble what looked at first like a complicated suspension system. “You just slide the suspenders on first, then when you pull the waders up, they attach here, and if you want to turn them into chest-high waders you use these clips here.” In fact what he was showing me was a deceptively simple solution to an annoyance of standard convertible waders: the suspenders tend to hang down behind you or bunch up in the fabric when you roll it down. 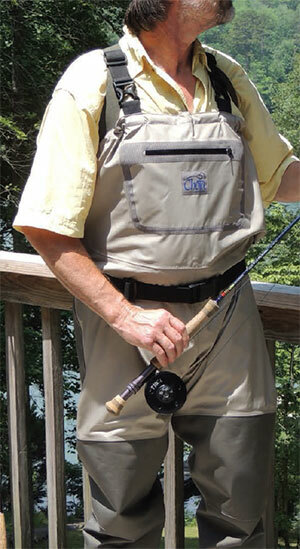 Chota’s suspenders sit comfortably on the shoulders without the waders attached. Like some other convertible suspender systems they make for easy roll-down even with outwear on. DUCS® Suspenders are patented and Chota is the first company to introduce DUCS-equipped waders. I’ve fished out of the new waders for only one day so far, but I am very pleased with the overall comfort and craftsmanship. In fact, these waders are as comfortable as any I’ve worn, and the fact that they retail for only $279.95 is a real eye-opener. When the fabric clipped into chest-high position, there’s a large chest pocket available, and when the fabric is slid down, a handy zippered pouch drops out. 3-ply breathable uppers with 5-ply seat and knees. Suspenders are very comfortable, perhaps because the fabric is wide and crosses at mid-back. The waders will be available beginning in October 2014. Here’s a Chota video that shows several of the key features.